Your guests will love this. Our Classical Guitarist is the perfect choice for any event. The subtle, intimate sound of the guitar will be played softly in the background as guests mingle and get ready for your big day. The classical guitarist is perfect choice of entertainment no matter how big or small the event. Our classical guitarist will complement any occasion. Ideal for drinks receptions, wedding registries, Marquee events,garden parties or even formal dinner parties. Our guitarist can cover all genre's from Classical through to Latin, Flamenco, Jazz, world and even current chart. Our guitarist is highly trained and will set the tone for your event. Guests will appreciate the Guitarist who will happily play any requests also. Although the Classical Guitarist is more popular during the warm up for most events he is becoming more and more popular for Bride & Groom entrances into reception halls and recently more so for the grand finale to your event, which will see guests coupling up to have the last dance of the evening or even huddling up for one last sing song their favourite chart topper or all time classic. The classical guitarist does not come with big speakers or heavy kit which makes him the ideal choice if you require something a little discreet in terms of entertainment. Add some character and ambience to your event with the Classical Guitarist. Available for bookings nationwide, exclusively through Kudos Music. 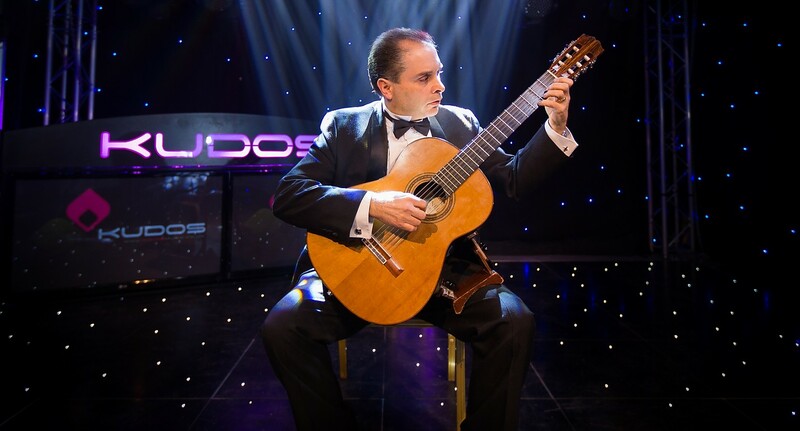 Why not book a Kudos Classical Guitarist for your wedding or event today! Contact the sales team to see how we can find the perfect entertainment for you.